A whirlwind weekend in Orlando, Florida, where our primary mission was to visit that book-inspired theme park within a theme park, The Wizarding World of Harry Potter, promised to leave little time for visiting book-related sites. But I was in for some pleasant surprises as one discovery led to another. Back in 1932 Frank Schutt, General Manager of The Peabody, and a friend, Chip Barwick, returned from a weekend hunting trip to Arkansas. The men had a little too much Jack Daniel’s sippin’ whiskey, and thought it would be funny to place some of their live duck decoys (it was legal then for hunters to use live decoys) in the beautiful Peabody fountain. Three small English call ducks were selected as “guinea pigs,” and the reaction was nothing short of enthusiastic. Soon, five North American Mallard ducks would replace the original ducks. In 1940, bellman Edward Pembroke, a former circus animal trainer, offered to help with delivering the ducks to the fountain each day and taught them the now-famous Peabody Duck March. Mr. Pembroke became the Peabody Duckmaster, serving in that capacity for 50 years until his retirement in 1991. 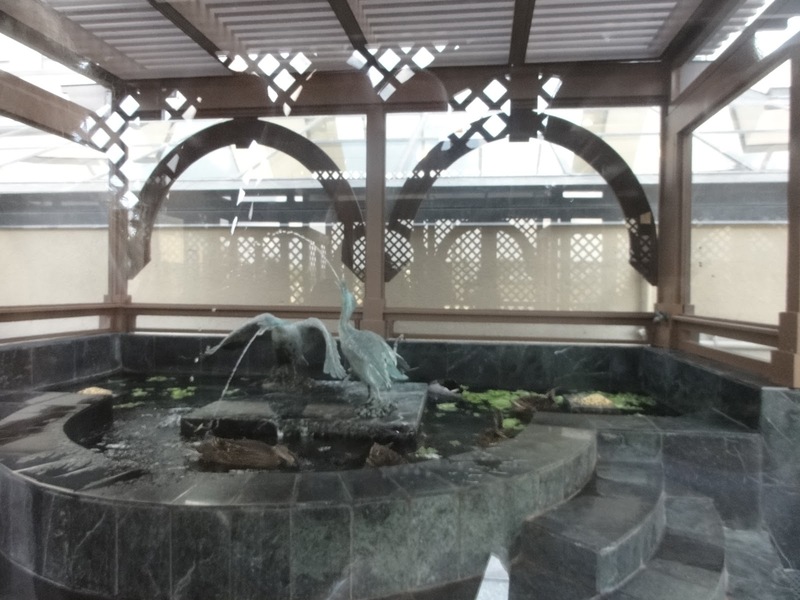 The original ducks have long since gone, but after 75 years, the marble fountain in the hotel lobby is still graced by ducks. The Peabody ducks march at 11 a.m. and 5 p.m. daily. The day we visited, a fairly inexperienced group of ducks were the stars and in a moment of confusion overshot the entrance to their private elevator—the one that leads up to their penthouse. Elevator reserved for the Peabody Ducks. afternoon sunlight before the parade. The Duck Master in hot pursuit. Posing for a glamour shot. But before long, all was well and the Duck Master took them away for a well-earned rest. Back in the penthouse for drinks. and available through online booksellers. 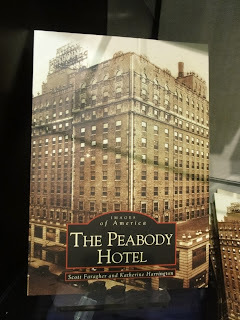 Until I read more, I didn't realize that the hotel was named for businessman and philanthropist George Peabody. 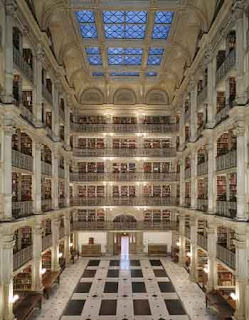 * Peabody financed a number of cultural institutions, perhaps most famously, the Peabody Institute, a music conservatory at Johns Hopkins University in Baltimore. 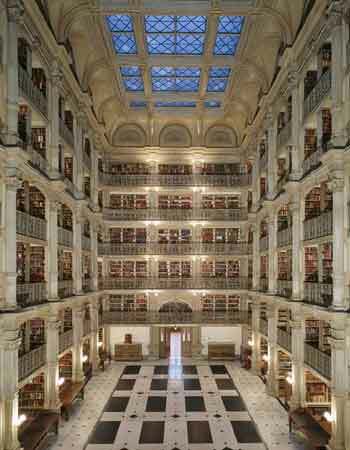 The George Peabody Library, also part of the university, is now high on the list of libraries I want to visit. multi-level atrium is also rented as an event space. 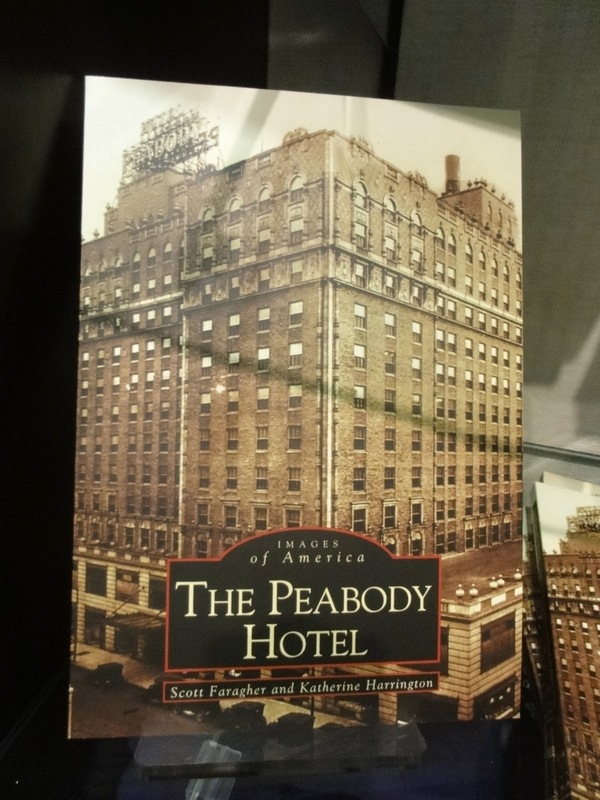 * From what I can gather, Peabody did not have a direct financial interest in the hotel. The builder, Colonel Robert C. Brinkley, who had turned to Peabody for financing on another project, chose the name. Leaving behind the ducks and their namesake, I wondered if we find real books in a land of make-believe? As it turns out, we did. At Universal Orlando's Seuss Landing, books were part of the architectural detail and were also for sale. a happy message for young visitors and their parents. For those in the mood for something a bit darker, at least two gift shops in The Wizarding World of Harry Potter carry the series of books. The shop attached to Olivander's, where wands may be purchased, also has this frightening creature on display. Note: The search for books at Universal was inspired in part a blog post by one of the owners of Yeoman’s in the Fork, a rare book and document gallery in Franklin, Tennessee. Love the ducks and the books! Wow! I love this duck hotel! Recently we were walking on a trail along a creek near where we live. We saw a duck couple out with their 8 tiny ducklings. They were SO tiny, maybe newly hatched - tiny round balls with beaks. They were SO cute. I was disappointed that I didn't have a phone or a camera with me. The next day, we took the same walk, and we saw them again, in the same spot. We couldn't believe it. This time the creek was running very fast from a recent rain, and the parents were trying to prevent the babies from being swept downstream. It was nerve-wracking, but the parents kept the whole brood intact. And again, no camera! The next day we took the camera... and didn't see the duck family. Saw lots of male ducks, but no chicks. We've been taking the camera every day since, and of course we've never seen them again! The Seuss store also looks great. Very tempting! You know my soft spot for all things duck...I'm glad the parents were able to keep their family together!